The National Union of Students in Denmark (in Danish, Danske Studerendes Fællesråd (DSF)) is a national interest organisation for students enrolled in higher educations in Denmark. Through 16 Member Organisations DSF represents around 165.000 students across the country. With this background and in close contact with a wide range of partners, DSF works on a daily basis to ensure students the best possible educations and living conditions. We have done so since 1932. DSF is an umbrella organisation for 16 Member Organisations, which are independent student councils and student organisations, primarily located at higher education institutions. On a daily basis, the Member Organisations works at their education institutions to make sure that the students interests are being heard on the local level. Twice a year, all Member Organisations gather for DSFs political conference, where it is for the Member Organisations to determine DSFs political course and to choose the political leadership of DSF. The political leadership of DSF consists of one president and two vice-presidents, who are responsible for respectively academic affairs and welfare and social affairs. In addition to the political leadership, two more people are elected, which together with the political leadership forms the Executive Committee of DSF. The Executive Committee are elected for a period of one year, and takes action to implement the decisions made by the political conference. 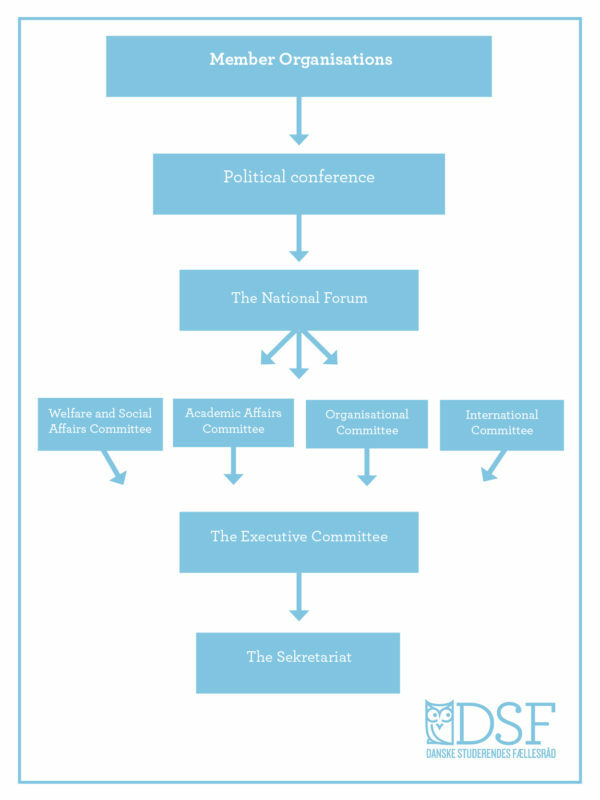 In the political work the Executive Committee refers to two committees; the Academic Affairs Committee and the Welfare and Social Affairs Committee, which, in the everyday work, are the highest authorities within each policy area. The organizational body, the National Forum, carries out the more action-oriented part of DSFs work. In addition to the political work in Denmark, DSF is also engaged in international student politics. This is primarily through the International Committee who represents DSF in the Nordic collaboration Nordic Presidential Meeting (NOM) and in the European student organisation European Students’ Union (ESU). At the same time DSF is engaged in partnership projects with students from other countries, such as Palestine and Zimbabwe. All students can participate in student politics and there are many opportunities to get influence as an active participant within DSF. All of this work is based on the bylaws of DSF.